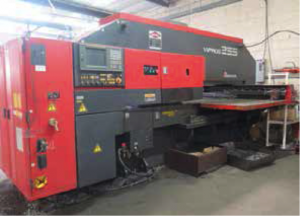 1999 Amada VIPROS 255 20-Ton 31 Station CNC Turret Punch Press s/n 25510307 w/ Fanuc Series 18-P Controls, 31-Station Turret, 2-Indexable Tool Stations, Automatic Sheet Repositioner, 49” x 101” Ball Top Table, Koolant Koolers HCV7500=PR-NF- FILT Cooling Unit. Muratec Wiedemann mdl. W-2040 “Wiedematic Mach II” 20 Ton 24-Station CNC Turret Punch Press w/ Fanuc System 6M Controls, 24-Station Turret, Manual Sheet Repositioner, 30” x 94.5” Ball Top Table. Ward Jet mdl. Z-613 CNC Waterjet Contour Machine w/ Cleveland Motion Controls Burny-Phantom ST Controls, Ingersoll Rand Waterjet System, Streamline SL-50 IV 50Hp Intensifier, Flow 6X Waterknife System, Axiom mdl. 10CF Garnet Hopper. 1995 Accurpress mdl. 7608 60 Ton x 8’ Cap CNC Hydraulic Press Brake s/n 3545 w/Accurpress CNC Gauging System, Pendant ETS Controls, 8 ¼” Throat, 79” Between Uprights, Light Curtain. Atlantic HD200-10 200 Ton x 10’ Cap Hydraulic Press Brake s/n 52024 w/ Atlantic Controls, Dial Back Gauging, 12” Throat, 122 ½” Bed Length, 103” Between Uprights. 1990 LVD Type JS/25/10 ¼” x 10’ Hydraulic Power Shear s/n 18006 w/ Comptrol Digital Controlled Back Gauge, 40” Squaring Arm. Tennsmith mdl. PN-9 9.5” x 9.5” Power Notcher s/n 15672 w/ 8GA Cap, Fence System. Haeger 6-Ton x 18” Hardware Insertion Press w/ Haeger Bowl Feeder, Tooling. Timesavers mdl. 137-1HFM/75 36” Belt Grainer s/n 22366M w/ 37” Belt Feed, Air Sentry Water Filtered Dust Collector. Tennsmith 16GA x 48” Power Roll s/n 10306 w/ 3” Rolls, Roller Stand. Strippit/ DiAcro mdl. 12-HR 12” Hand Roll s/n FL-1343 w/ 2” Rolls. Hydraulic Universal Tube Bender w/ Hydraulic Unit, Steel Table and Tooling. Diamond 70FP Style BG 70-Ton Back Geared OBI Stamping Press s/n 62-BOI w/ Pneumatic Clutch, 6” Stroke, 3” Slide Adjust, 21” x 31” Bolster Area. Kenco mdl. 8-101 8 Ton OBI Stamping Press s/n G728-163 w/ 8” x 11.5” Bolster Area. L &amp; J No. 2 OBI Stamping Press w/ 12” x 18” Bolster Area. Graziano Tortona SAG-14 14” x 60” Geared Head Lathe s/n 3152 w/ 80-1500 RPM, Inch/mm Threading, Tailstock, Steady Rest, Aloris Tool Post, 12” 4-Jaw Chuck, 10” 3-Jaw Chuck. Econotek mdl. 1340 13” x 40” Geared Head Gap Bed Lathe s/n 9650406 w/ 70-2000 RPM, Threading, Tailstock, Aloris Tool Post, 6.5” 3-Jaw Chuck. Bridgeport Vertical Mill s/n 169204 w/ 1Hp Motor, 80-2720 RPM, 8-Speeds, Chrome Ways, Power Feed, 9” x 42” Table. Hartford Vertical Mill w/ 2Hp Motor, 80-2720 RPM, 8-Speeds, 9” x 42” Table. Harvel 6” x 12” Surface Grinder w/ 6” x 14” Magnetic Chuck. Rockwell mdl. 31-520 6” Pedestal Belt Sander. Import 6” Belt / 12” Pedestal Disc Sander. Startrite mdl. 20RWF 20” Vertical Band Saw s/n 90039 w/ Blade Welder, Dial Change FPM, 21” x 21” Table. Powermatic mdl. 1150A Adjustable Speed Pedestal Drill Press s/n 9115V123 w/ 90-4800 RPM. Dayton 20” 9-Speed Pedestal Drill Press. Makita Miter Saw w/ Stand and Fence System. Linde VI-253 CV-DC Arc Welding Power Source w/ MK Cobramatic MK-3A MIG Feeder. Kemppi mdl. KempoTIG AC/DC 250 250 Amp AC/DC Arc Welding Power Source. Miller Portable Spot Welder w/ Stand. Press Brake Tooling and Rack. Dynabrade Pneumatic Belt Sander, Electric and Pneumatic Pad Sanders, Orbital Sanders and Bar Sanders, Angle Grinders, Electric and Cordless Drills, Pneumatic Pin Grinders. Etalon 24” Dial Height Gage. Meyer Pin Gage Sets .061”-.500”. Mojave 36” x 48” x 6.5” Granite Surface Plate w/ Roll Stand. Clark CGC20 3300 Lb Cap LPG Forklift s/n C365L-1207- 9464FB w/ 2-Stage Mast, 130” Lift Height, Side Shift, Cushion Tires. Sheet Stock and Shop Carts, Shelving, Work Benches.